Six of the next eight Tour de France stages are in the mountains. And stage 12 is the first of four gigantic mountain-top finish stages (12, 14, 18, 19) in this hillier than usual Tour de France. 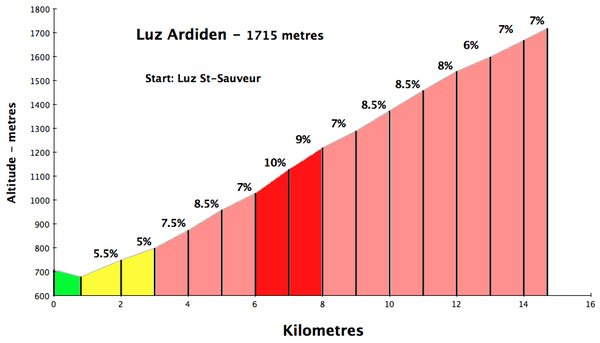 On the menu today: Three huge climbs including the Tour’s usual annual visit up the legendary Col du Tourmalet as well as a challenging final climb to Luz-Ardiden. In 2003, Luz-Ardiden played host to one of the more exciting stages in recent history. Think Armstrong, Mayo, musettes, crash, Ullrich, and Hamilton (more below). Stage 12 is also Bastille Day. So, as required by French law, every French rider will attack at least once – regardless of how pointless it is. Let’s take a closer look at each of the three climbs. It would be more accurate to say that the 2011 TdF mountains start half way though stage 12. The sprinters may get one more chance to play lead-out lottery at the mid-point sprint (119 kms). But after that? This Tour de France is heading up. Hourquette comes from an old gascon word hurket?, derived from the latin furca (fork). It is sometimes used in the Pyrénées instead of “Col” (mountain pass). Ancizan is the town down below. So this is the Col d’Ancizan. Tour de France History: This will be its first ever Tour appearance. This little known road is just south of Col d’Aspin – which has appeared 70 times in the TdF – usually in combination with Col du Tourmalet. 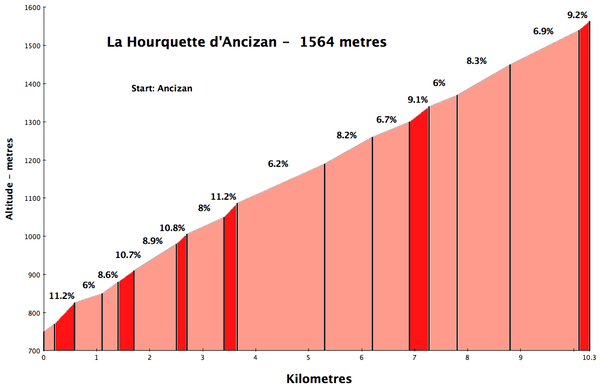 The descent of La Hourquette d’Ancizan will end by joining the very bottom of the west side of Aspin, before approaching Tourmalet. This intriguing “Aspin substitute” is both steeper and higher than Col d’Aspin. I have no idea the road quality (hopefully the local mayor received a “repaving budget” last year), but probably a narrow route. This east side has more steeper stretches than the west side (after an easy start). It passes through La Mongie ski station about 5 kms from the summit – and then winds up the ski slopes to the summit. Tour de France History: 2010 was the hundred year anniversary of the first appearance of Tourmalet in the TdF. 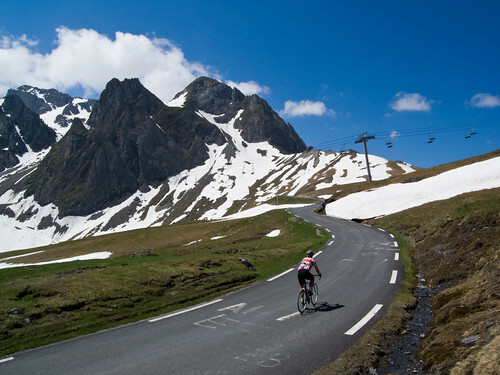 Similar to Col du Galibier this year, in 2010 Tourmalet appeared twice in the TdF, including a much-hyped mountain-top finish “won” by Andy Schleck — with the same time as Contador — in what many saw as an unsatisfying stage. 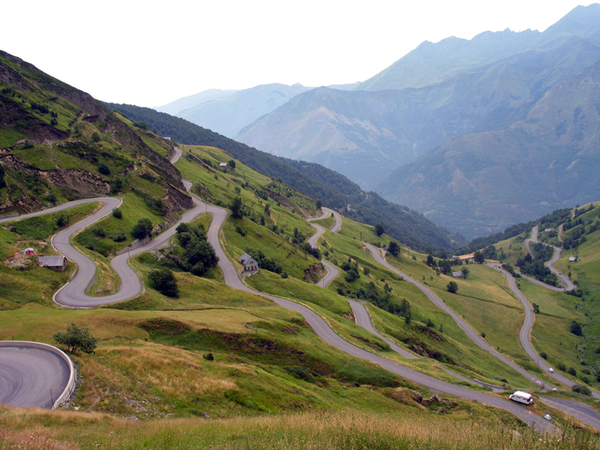 For more history and a list of first-over-Tourmalet for every stage since 1910: see here. 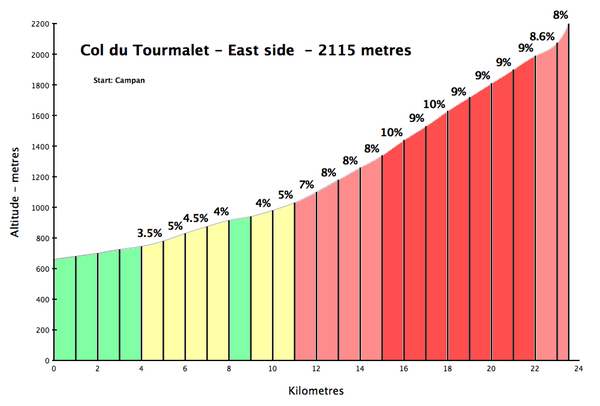 Below: The Tour route will turn onto Tourmalet skipping roughly the first five easy kms shown on the profile below. Luz-Ardiden is a medium-sized, purpose-built (in the 60’s) ski station above Luz-St-Saveur (in the valley between Aubisque and Tourmalet). Tour de France History: It has appeared seven previous times – first in 1985 – always as a mountain top finish. Most of us will remember Its last appearance in 2003. On the lower slopes Lance Armstrong fell after getting his bike caught on a fan’s musette, also causing a carrot – Iban Mayo – to fall. Ex-Armstrong teammate Tyler Hamilton (they were friends once!) played patron forcing Jan Ullrich and others to slow somewhat. Next, Armstrong just looked super-human in one of the more amazing wins of his career. Other winners at Luz-Ardiden: Delgado (’85), Lauritzen (’87), Cubino (’88), Indurain (’90), Virenque (’94) and, Laiseka (2001). This stage isn’t just any old mountain-top-finish stage. It’s three huge climbs, one after the other. A hugely difficult day. I suspect we’ll have a far better idea of who might win the Tour at the end of this stage (or at least a few more names that are no longer in contention).